In May this year, Julie Ward, a British member of the European Parliament from the Labour Party, will intern at the Bonnefanten Museum in Maastricht, the Netherlands. She chose the museum because she is interested in ancient artefacts, design and community work, and, particularly, because of the museum’s focus on youth, gender and sexuality. It is part of the political internship programme initiated by the Network of European Museum Organisations, to give politicians an understanding of the workings and importance of museums. It is actually an extension of a programme called ‘More Than Worth It’, run successfully by the Netherlands Museum Association. So, do not be surprised if you find a Dutch minister behind the reception desk, when you enter a museum in the Netherlands. Politicians play an active role in cultural activities in the west. They are regular visitors to galleries, museums, art shows, fairs and biennales. I vividly remember the Argentinian president visiting the Argentinian pavilion at the Venice Biennale in 2011, when I had gone there with Riyas Komu, Sunil V. and Shwetal Patel to make our first presentation about the Kochi-Muziris Biennale to an international audience. Incidentally, that was the only year when India had a pavilion at the mecca of contemporary art. My first encounter with a culturally, socially and politically conscious minister from a European country was during ARCO 09, Madrid, where India was the focus country and I was the guest curator. I thoroughly enjoyed the company of the politician who was talking to me about art, sans the company of bodyguards or bureaucrats. I wondered if such a thing would ever happen in India. 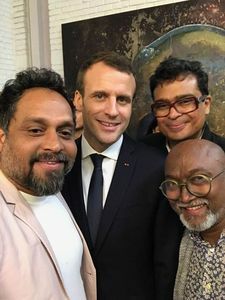 In elite company: (Clockwise from left) Riyas Komu, Emmanuel Macron, Jitish Kallat and Bose Krishnamachari. But, when we began the Kochi-Muziris Biennale, several Kerala politicians including former chief minister Oommen Chandy and the current chief minister, Pinarayi Vijayan, visited the event. Some of them have not missed any edition since. KMB was born out of former culture minister M.A. Baby's wish to bring international visual art to Kerala. Last year, president Pranab Mukherjee visited the biennale and addressed the audience. Here I am writing about another president’s visit. Recently, French President Emmanuel Macron came to India on an official visit. And, guess what was on his itinerary. A trip to artist Subodh Gupta’s studio. Subodh is having a major retrospective at the 1,154-year-old Monnaie de Paris—the French mint is the oldest enterprise in the world. The charming president and his cheerful wife, Brigitte, visited the Gurugram studio where Subodh and his wife Bharati Kher work. Also in attendance were 60 invited guests—artists, designers, writers, museum directors and gallerists. Subodh took our hands (Riyas’s and mine), pulled us closer to Macron and said: “I wanted to introduce both these artists. They have changed Indian art and we are so proud of India’s biennale in Kochi.” Later, we met again and explained KMB in detail to an attentive president. He was, of course, coming from a culturally conscious country. The French understand the value of soft power. France has the most visited art museums and cultural spaces in the world. Macron's visit to Subodh and Bharti's studio is history. I hope our political figures also come down to earth. At least, our new and young blood should respect the wealth of art and culture. Art is humane and humble; it is like a mirror. Riyas could not miss the selfie-opportunity. He took out his mobile and asked if he could take a selfie with Macron. Jitish [Kallat] and I squeezed into the frame! Just before the president left, he said to us: “I know where to go on my next visit.” After a pause, he said: “Kochi!” He might as well. Is Imran Khan's preference for Modi a clever manoeuvre?